JetBlue Flight 292 made a spectacular landing at LAX today. Somehow, the nose gear got stuck sideways on the Airbus A320, so they flew around for 3 hours, dumping fuel in the Pacific before landing on LAX runway 25, the longest runway at LAX. Pilot and crew did an excellent job of setting the nose down gently and preventing a potential catastrophe. Video of the emergency landing at Political Teen. 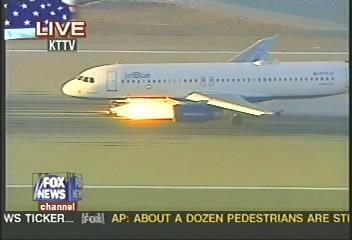 Keep in mind that JetBlue has Live TV with CNN coverage. So these poor people were watching what we were watching before they landed. Ouch. This picture looks eerily familiar. Update: Correction - Apparently, the Airbus A320 does not have the capability to dump fuel, hence the 3 hours spent circling above LAX. Update 2: Apparently the Airbus has a history of nosegear problems. How comes that nobody gievs the name of the pilot?????????????????????????????? This is a fair question. I looked, and I can't find it anywhere. I had little trouble but am having a hard time finding any further info. Appears pilot and crew were cool and did a great job.